I’ve been experimenting for a while with pizza dough, looking for one that will hold up well to the amount of toppings I typically use, is fairly healthy, can be made in the baby bread maker, and is really tasty. I started out with the recipe from The Bread Lover’s Bread Machine Cookbook, and adapted it to be used in the smaller bread machine (West Bend Just for Dinner Breadmaker). Then I started playing around. I now use raw milk instead of water, because I am forever trying to get enough servings of calcium into us. (5 servings a day is hard!) I use 1/4 whole wheat, because I like the nuttier flavor, and it is healthier. First, put your pizza stone in to soak. If I don’t have that at the top of my directions, I forget. 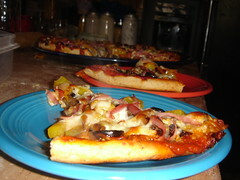 It really makes a difference in the texture of the final crust. Put all of the ingredients into the bread machine pan, press start, regular cycle. When the machine beeps at the end of the cycle, press stop and unplug the machine. 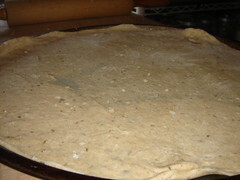 Remove the dough onto a lightly floured surface, and shape into a flat round disc, cover with a damp towel, and leave for 30 minutes. Then cover with pizza sauce and your favorite toppings, put the soaked pizza stone on the bottom rack, and cook the topped pizza an additional 18 minutes on the upper rack. When it is done, I serve it on one of my favorite dishes, a Fiestaware pizza pan, but I’m having an affair with Fiestaware these days. Just tried this tonight and it turned out great! I didn’t use the pizza stone, but otherwise followed the directions. Your efforts are much appreciated. This recipe is a keeper. Thanks so much.